Book now to Royal Tourmalet SPF for 2019 and save! 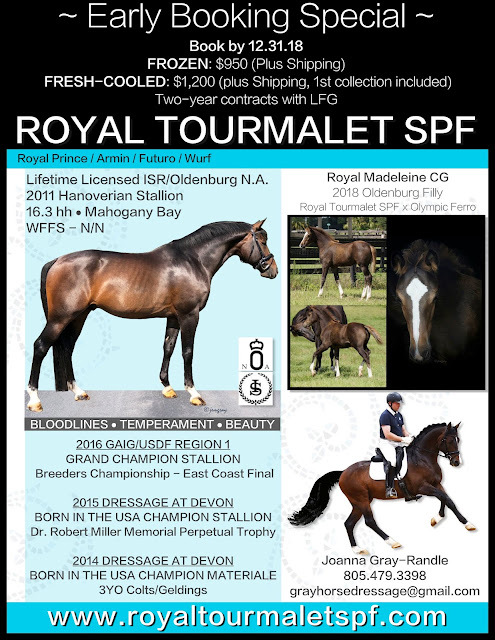 Royal Tourmalet SPF is a 2011 Hanoverian stallion who is lifetime licensed by the ISR/Oldenburg NA and the AWS. He is by Royal Prince out of a mare by Armin. Royal Tourmalet SPF is 16.3 hh and is WFFS N/N. A new format for stallion testing for sport horses in North America was introduced in 2017, as a joint effort between the American Hanoverian Society, Oldenburg Verband, and Hanoverian Verband, in cooperation with the German FN. The format agreed upon for North America was a three-day test. It follows the European trend away from a single, long stallion test (the days of the 100-day test are over), and towards "appraising the stallion's training progress and development at multiple points in their early career." The test was held in two locations last year, Maryland and California. The North American Stallion Sport Test for 2018 begins this week at Hilltop Farm in Maryland, followed by the Pollyrich Farm, California testing on November 5–7. Below is the schedule for both testing locations. For more information, please visit the North American Stallion Test website. 5:30 Wine Tastings, Followed by Dinner Party - $50/ticket all-inclusive. 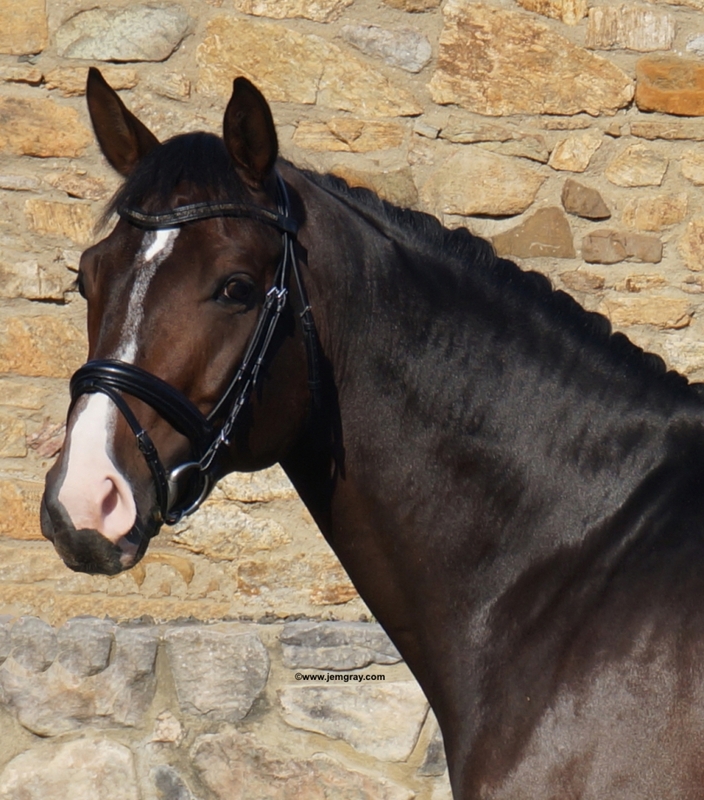 Bloodline analysis of Verdades, world’s number one dressage horse. The Horse Magazine photo by digi-shots. The Horse Magazine has once again published its analysis of the horse, breeder, and studbook rankings of the World Breeders Federation for Sport Horses. Christopher Hector discusses the rankings and bloodlines, well-illustrated from his unparalleled archive. A new addition in recent months is statistician Gemma Alexander, who wrangles numbers for statistical insights, made more visual with charts and graphs. Standings are evaluated for dressage, show jumping, and dressage. What we should be rewarding, from young horse competitions to Grand Prix: Carl Hester and Uthopia at the Rotterdam European Championships in 2011, when "when the Brits unveiled the power of harmony." HorseMagazine photo. Christopher Hector, publisher of the online HorseMagazine.com, has some strong opinions about how young horses are shown, as exemplified in the Young Horse classes and the World Young Horse Championships. His 2017 article, Young Horses, What Do the Judges Look For?, presents his own opinions about how tension has been rewarded in dressage showing, and the evils of that trend, especially among young horses. He then interviews Susie Hoevenaars and Francis Verbeek, "two judges at the cutting edge of international young horse competition," about their priorities. One of the wonderful things about articles like this on HorseMagazine.com is that, with a team of photographers at many international events, the illustrations are many and excellent. To read the full article and enjoy the many photos, click here. If you watched the 2018 Young Horse Championships, did you see the tension Chris Hector describes and illustrates, or do you feel the extravagant movement shown by many of the young horses represents the horse's natural way of going, the result of better breeding? You are invited to comment below. His first crop produced Corso, who, ridden by the Swiss Willi Melliger, won many Grand Prix and speed classes, and competed at the European championships in St. Gallen in 1987, the World Cup final in Gothenburg in 1988, the Nations Cup at Aachen and the European Championships in Rotterdam. Suddenly his offspring were in huge demand and setting record prices. Three of his important sons were then licensed for Holstein: Carthago (1987), Cassini I (1988) and Cento (1989). Indoctro was licensed in Holland in 1990 and spread the blood of Capitol to that country. Following the success of his progeny, Capitol moved to 2nd on the WBFSH standings in 1999, and to first place in 2000 and 2001. At the Olympic Games in Sydney in 2000, he was represented by three horses: Carthago, Campione M and Cento. At the Athens Games, he was represented by four: Cardento, Casita, Cento and Goliath. As of 2007, his offspring had won over €5.3 million. There are 34 of his stallion sons world-wide and 25 in Holstein alone, and they have proven wonderful sires in their own right. Capitol I’s full-brother, Capitol II was initially rejected by the licensing commission but was approved based on his performance as a showjumper, but he failed to follow his brother’s footsteps and left nothing of interest. In the 2007-2008 Monneron leaderboard of the top 75 jumping stallions in the world, based on the FEI results of the top 2515 jumpers, Bernard le Courtois finds four major stallion lines: Almé, Cor de la Bryère, Landgraf and Capitol I. Capitol ranks 37th with 8 winners. His best performer is the mare Gitania – but five of his stallion sons feature in the top 75. On the 2013 German FN list of the top 1% of jumping sires, Capitol is represented by three sons: Carthago (12th), Cardento (18th) and Cassini I (28th). Examining the breeding at the WEG in Caen, what did come as a bit of a shock was the influence of the somewhat unfashionable Capitol. The most represented Capitol line stallion was his son Cardento with six, but then there was Indoctro with four (three of them ridden by less than professional riders), Cassini I provided three, then there are two by Cento, one each for Canadian River and Centauer, two by Capitol’s grandson, Cumano, one by another grand-son, Colman and one by Capitol himself. Capitol I grandson Imothep, at the WEG in Normandy, with Darragh Kenny riding. Click here to read Imothep's Stallion Profile on WarmbloodStallionsNA.com. See below for more stallion descendants in North America. Devon, PA – Day 3 at Dressage at Devon (www.dressageatdevon.org) had something for everyone. Breed and performance competitors were at their best, under mostly clear skies. Thursday started off with sunshine and the breed show. All the horses were special but two stood out. Summersby II (Sezuan), bred by Nicole Wanning and owned by Grand Prix rider Alice Tarjan. This striking mare is a 17.3, 3-year-old Oldenburg. She won the Filly Championship, took home the blue in the 3-year-old Dressage at Devon Prospect Champion, won the Dressage at Devon Grand Championship and the USDF DSHB Mare Final with a score of 80.925. She was in the winner’s circle again, placing first in the USDFBC Three-Year-Old Materiale Championship with a score of 91.25. Tarjan is known for ability to spot a new prospect and bring it along to top levels – in her spare time. She is a lawyer who works with her husband in their trucking and rigging business as well as in real estate. Dhanube (Destano/Special Premium Lhorna Doone by Londonderry) is owned and bred by Maureen Swanson, a breeder from Slatington, Pennsylvania, was another star. This 16.2, chestnut mare was Dressage at Devon Reserve Champion Mature Horse, overall high score Born in the USA (84.350%), winner of 4-year-old and older Maiden Mares, 4 year old and older mares under saddle, GOV class, and Mare Champion. She is 5th generation from Swanson’s breeding program and descends from her first Hanoverian riding mare. The USDF DSHB Stallion Final was won by Lionel, a 17.1 bay Danish gelding, owned by Cara Kettenbach and bred by Oak Hill Ranch (North Andover, MA). The USDFBC Current Year Foal Final was won by Noah ISF (Contango/Cayenne w), a 12.3 bay colt bred by Iron Spring Farm. The USDFBC Filly Final was won by Savannah HTF (Sternlicht ggf/Allegra q) with a score of 78.438. This two-year-old Hanoverian was bred by Hilltop Farm (Colera, MD).